Faiz Ahmad Faiz's daughter was recently sent back to Pakistan, despite being an invited guest in the land of the Mahatma. But the truth is, Faiz's grandson writes exclusively for DailyO, the people of both nations love Faiz — and peace. "When injustice becomes law, resistance becomes duty," wrote Thomas Jefferson. In the fall of 2016, the Jio MAMI eighteenth Mumbai Film Festival decided to ban the showing of the film Jago Hua Savera, written by Faiz Ahmad Faiz, and boasting a galaxy of Indian actors, including Padma Shri recipient Tripti Mitra of the Indian People's Theater Association. 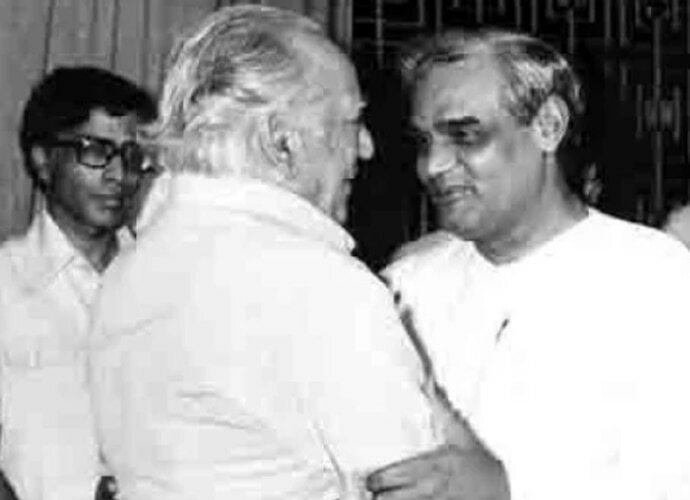 File photo of Faiz Ahmed Faiz (left) and Atal Bihari Vajpayee. In an article at the time, I lamented the rise of bloodthirsty jingoism on both sides of our shared border and pointed out the obvious: Faiz belonged as much to India as he did to Pakistan. While he was born and raised near Sialkot in Pakistan, Faiz's first job out of college was in MAO College, Amritsar; he served in the British Indian Army in Delhi during World War II, got married in Srinagar and maintained a deep affection for the land that became India after 1947. Both his daughters were born in what is now India. While Faiz never proffered an opinion about Partition per se, his editorials in The Pakistan Times from 1947 make clear what he thought of the communal bloodshed. At one point, he wrote, "The Muslims have got their Pakistan, the Hindus and Sikhs their divided Punjab and Bengal, but I have yet to meet a person, Muslim, Hindu or Sikh who feels enthusiastic about the future. I can't think of any country whose people felt so miserable on the eve of freedom and liberation." These were the same sentiments he expressed in his iconic Subh-e Azadi (Dawn of Freedom), the poem written in August 1947, about the butchery taking place in the Punjab and other places in the name of religion and patriotism. Earlier the same year, my biography of my grandfather Faiz, Love and Revolution, was published in Delhi. I had worked on the book for over three years and was eagerly looking forward to launching it in Delhi amid friends and well-wishers. Sadly, by the time it came out, relations between our two countries had once again deteriorated, and I felt it wise to stay away until things improved. Little did I know that things were going to get much worse. Last week, my mother Moneeza Hashmi, an internationally renowned media personality, travelled to Delhi to attend a media summit organised by the Asia-Pacific Institute for Broadcasting Development (AIBD) based in Kuala Lumpur. She had given key note addresses at many of these conferences in years past. She had been officially invited and had a multiple entry visa to India, which she uses frequently to go see friends and invite artists and writers to participate in the activities of the Faiz Foundation, based in Lahore. But the evening of her conference, we received a distressed call from her. She was at the hotel where the conference was supposed to be held - and she had been told that her registration had been cancelled. Not just that, her hotel reservation had also been cancelled and the organisers were even refusing to let her attend the conference - or even to have dinner with the delegates! One of the organisers, an old friend, who, according to her, was "on the verge of tears", hurriedly arranged for her to stay in another hotel. I was furious but my younger brother, wiser than me, reminded all of us that reacting angrily was not the Faiz way. My mother stayed on in Delhi for a couple of meetings and then came home without speaking out about this mean-spirited incident. Despite her discretion, some media outlets got a hold of the story and I was asked to present the point of view of the Faiz family and the Faiz Foundation. So, here it is: We believe that this flagrant violation of the rights of an honoured guest and of basic sub-continental hospitality in no way represents the opinions and attitudes of the vast majority of Indians (and Pakistanis). This is easily demonstrable on cross-border visits. I have lost count of the number of times a taxi driver or street vendor in Delhi refused to take money from me when they found out I was from Lahore, regaling me instead, with stories of their grandparents who hailed from Punjab. Indians who have visited Lahore have told similar stories. We all want to live in peaceful co-existence and our differences, whatever they may be, can also be worked out in peace. This is not meant to excuse short-sighted people on both sides who want to provoke war and violence between our neighbouring countries; simply to point out that, as Faiz said, peace is the common heritage of all mankind including the people of the subcontinent. Faiz himself, even in 1965, under tremendous pressure from the Pakistan government to write "patriotic songs", refused - he instead wrote the heartrending Sipahi ka marsiya (soldier's elegy), an ode to both a Pakistani warrior and an Indian hero who lay down their lives in defence of their motherland in a war not of their own making. And in his Lenin Peace Prize speech, Faiz called peace "...the first condition of human life in all its beauty". Peace and freedom, he said, is "so very beautiful and radiant... everyone can imagine that peace is amber waves of grain and eucalyptus trees, it is the veil of a newly-wed bride and the gleeful hands of children, the pen of the poet and the brush of the painter and that freedom is the guarantor and tyranny the murderer of all those things that differentiate humans from animals: intelligence and awareness, justice and truth, bravery and chivalry, goodness and compassion". The writer is a psychiatrist practising in Lahore. He taught and practised Psychiatry in the United States for 16 years. He is the author of Love and Revolution: Faiz Ahmed Faiz, the authorised biography.